Today we’ve got a roundup of projects that are organizational in nature so you can keep your creative space tidy . . . all while having great reasons to sew! Inside there’s plenty of room for scissors, needles, threads, and other tiny treasures. Store lots of little items right where you need them—at the sewing machine! Sewing Machine Mat from Text It! 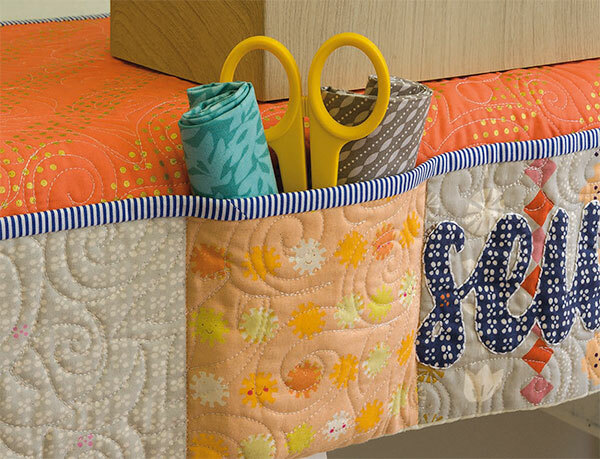 Scissors, rotary cutters, fabrics, machine needles, threads, a seam ripper—five pockets provide room for all of it! 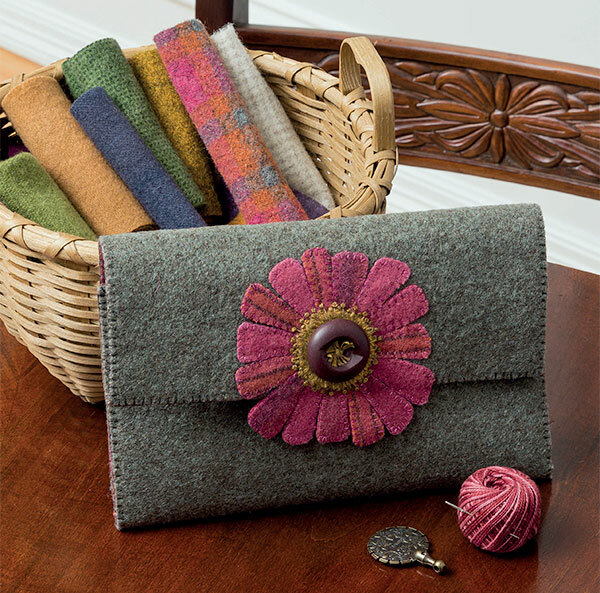 How about whipping up an adorable little bag for your buttons? 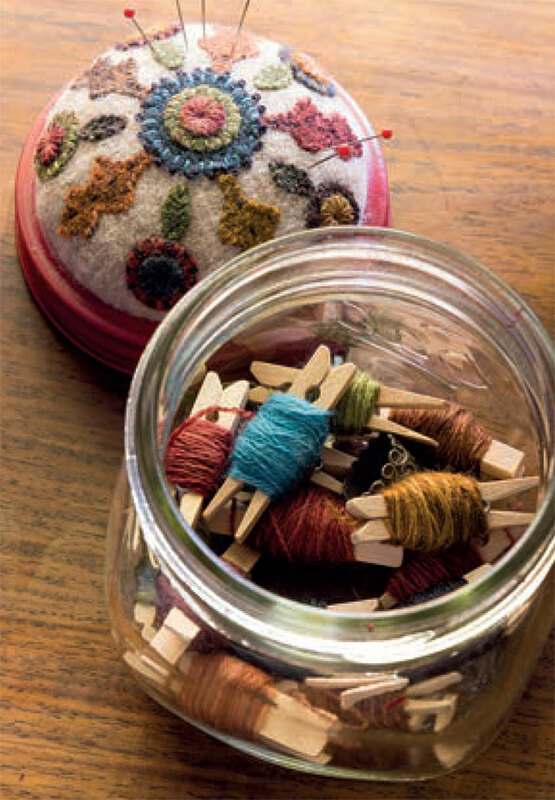 Pins on top, threads down below—Kim Diehl sure does know how to dress up a mason jar! 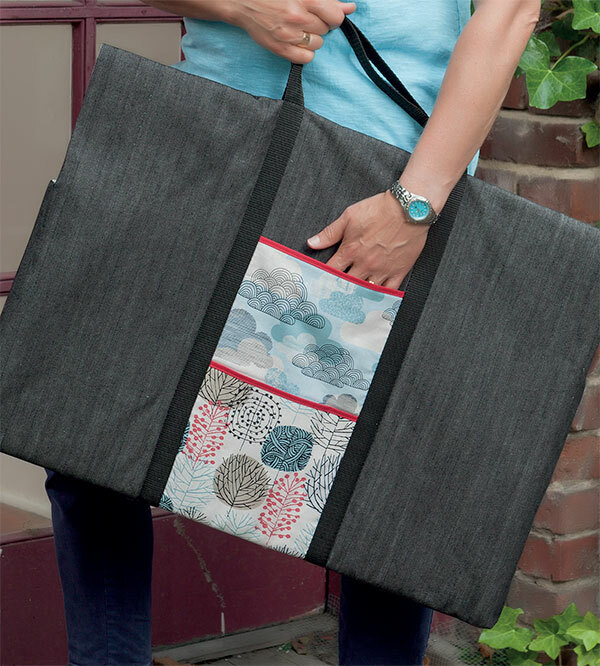 The Ultimate Equipment Tote from Make It, Take It opens to reveal a removable padded ruler holder with pockets you can custom-sew to accommodate your personal ruler collection. Two bonus sleeve pockets and a zipper pocket on the tote’s exterior give you LOTS of room! 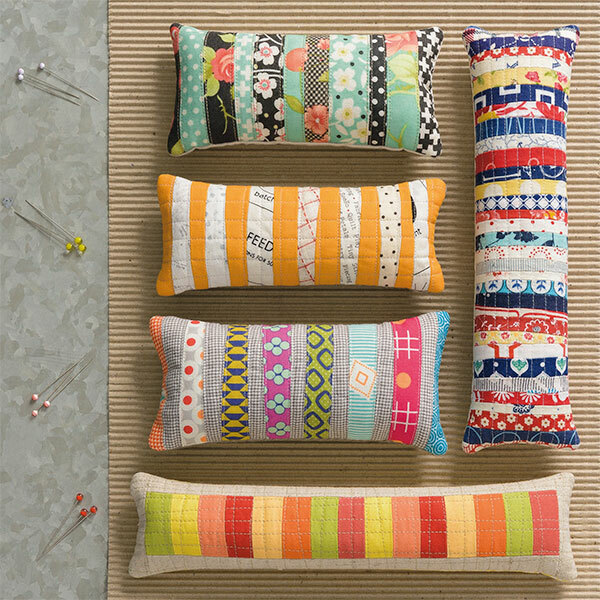 We hope these sewing-organization ideas for small spaces will help you enjoy your sewing time even more! How much space do you dedicate to your sewing? I’ve overtaken the kitchen table. I’ve carved out a small space just for me. I have a room dedicated to my sewing. 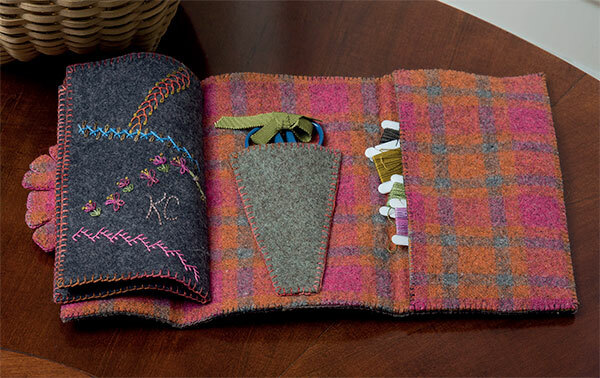 Look in any nook or cranny—you’ll find my sewing stuff there! I use my dining room as a sewing room since we really only use to eat in a few times a year LOL. I turned the kids old bedroom into my sewing room. I have a small corner in our family room that tends to be out of control most of the time. I like to be close to the family when I sew, but I desperately need a better system to keep everything organized!…or a bigger house which is not happening! I have 2 rooms dedicated to my sewing. Fabric storage in the guest bedroom, and work area in what used to be the dining room. I used to have a room dedicated to sewing before children and grandchildren. So now my sewing machine is in our living area where I am constantly having to keep it tidy. The bedroom I had still stores my fabric. One day I will be able to move back into the bedroom where it will be all mine to organize as I wish. So I guess I now fall into the category look in every nook and cranny and you’ll find my sewing stuff. When my kids were little I sewed on the dinning room table. They were never allowed to eat at the table because my sewing stuff was always there. I always wanted a sewing room. By the time they were both grown and gone, I made my dinning room into my sewing room. It had the best lighting. Now my sewing has taken over my whole apartment. You can look at it as a sewing studio with kitchen and bed or an apartment that has too much sewing stuff. I love to sew and I don’t live with anyone else so I can do as I please. I do plan to organize it this weekend. I’m in the inlaw apartment, formerly the family room, so my living room is at one end of 13×25 and all my sewing at the other. I do have paths through it all! So I will call it a dedicated carved out space AND nooks and crannies! But it is the most space I’ve ever had and a work in progress to make it most usable! Next step? the granddaughter almost toddling, time for child proofing because the bright shinies are so enticing! I have a section of the basement for my sewing. It’s squeezed between food storage, canning products and my husbands work bench. Upstairs, downstairs, even in the attic – fabric makes me feel cosy, warm and fuzzy! Oh my goodness, I have taken over the entire basement and 2 bedrooms upstairs and my quilts are spilling out into every room of the house. 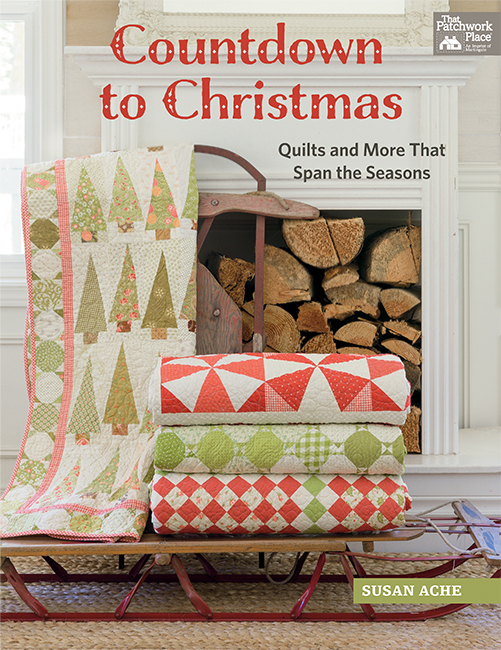 There are so many cute ideas that were shown, some of these would make great gifts for fellow sewers/quilters. 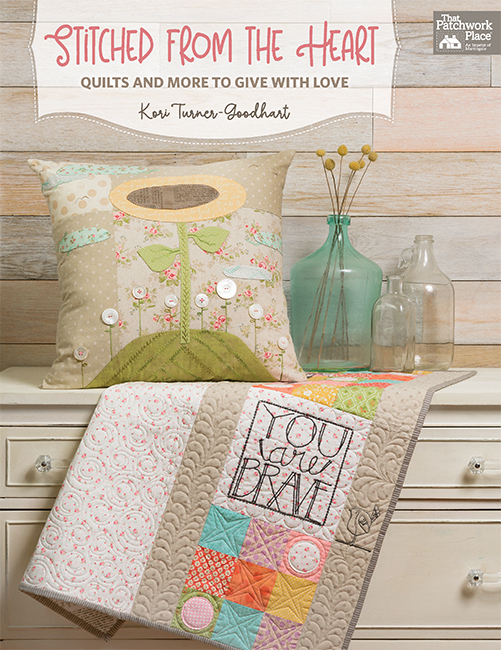 I’m lucky enough to have a room dedicated to Sewing nut love the items in the book! I have a room for my sewing, but it still manages to flow out into another closet and handwork scattered in the living room. I have a room I use for all my sewing/quilting/rug hooking ‘stuff’. But I usually end up in the family room with the television on and my feet up while I work on ‘the project of the day’. We are building a new house this summer and I will have my own sewing room. Right now I use the kitchen table for sewing and a card table in a bedroom for cutting and storage. My sewing space is the corner of our guest room. Of course it has spread onto the shelves and dresser as well! 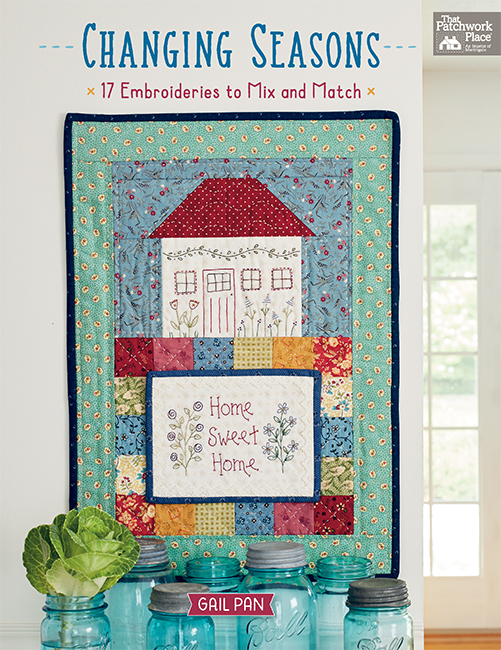 Thanks for the chance to win this book – I have an entire bedroom dedicated as my sewing room and just love it! Ummmm, I haven’t resorted to the bathrooms yet, but hey, I have been eyeing that big empty space in the bathtub! I fall most decidedly into a nook and cranny category. What I like about all the ideas presented is that the more organized my sewing space, the more time I have to sew! Well I’ve taken over part of living room, the dining room table, part of the entry way and two bedrooms. I have a small 9 x 12 room which I keep very organized, dedicated for my sewing. My husband added higher cabinets on two walls for me to wrap my fabric around cardboard and file in bookcase style as well as a peg board above my cutting table to hang scissors, rotary cutters and other small supplies. I have the entire closet in that room with shelves for more supplies, a bookcase for my books. I even have a recliner w/a stack table next to it and a 25″ flat screen TV on the top of the bookcase to watch my sewing shows while doing hand work. It’s my sanctuary! I would love to have that book in my collection. I am lucky and have a room with a large window! I have a dedicated area for sewing but I still have a tendency to gravitate to the dining room table. It’s really senseless but that was my space for 30 years. I have one dedicated bedroom that is entirely sewing. It has spilled over. I would like to be able to have just one area. I am blessed to have a basement with room for all my quilting needs as well as a corner to read and relax. The sewing/quilt room looks like a hoarder lives there. I need help. much of my need it now things are in the family room. I am trying to organize there. I am also trying to turn our grown daughter’s bedroom into a place for everything that is in the cellar. I also sew on the go. I prefer my featherweight machine and it has spent a month in South Carolina in January and goes back and forth to our cottage about 90 minutes away. looks like a great book. I have the smallest bedroom in the house that I dearly love. 23 years ago it seemed huge. Now, though, it seems to have shrunk. I have a room dedicated to sewing and quilting. It is a tiny bit on the small side, but it is all mine and fabric storage. I have my own room. I am very blessed to have this space. What cute ideas, so clever and would be fun to make. In would do the little clutch first. I have a whole room, but it still shows up all over the house! I have a room, but it ends up all over the house. The family room was my sewing room until one of the kids left home. Now I have the whole upstairs loft! Quiet and out of the way…the mess doesn’t bother anyone anymore. I do need to do some of these projects to make everything more fun and organized. Good timing! I have taken over the dinning room table and lots of nooks and shelves! I have half of my basement dedicated for my quilting. A few years ago I painted the very dark paneling with bright colors and absolutely love spending my time down there (especially when there’s a blizzard outside). I have a room dedicted to my sewing and quilting. I have been fortunate enough to have the extra bedroom turned into my sewing/crafting room. I use one of our 3 bedrooms, but my sewing has been known to be in the guest and master bedrooms also. Just need a small detached room not unlike Kathy’s 16 X 20 foot area! I have a bedroom chock full of sewing/craft stuff. The linen closet right outside that bedroom has 1 shelf dedicated to linens, and the rest is sewing/craft stuff. My ufos and projects in the thinking stage have taken up residence in my guest room, and my sewing machine and other sewing necessities are in the living room. Luckily, I live alone in a 4 bedroom house so there’s no one but me to complain. I love it, so no complaints from me!! I’ve carved out a small space just for me… But look in any nook and you’ll find my sewing stuff there ! I have a room but as any quilter would say It is not big enough. Organization must be done occasionally. I took over the living room! It was the biggest room in the house with the best lighting… and the least used room. My family has grown and moved away. I rarely have company; let’s meet up at a restaurant, etc. I ‘entertain’ myself by sewing in the living room! And the small bedroom has become the ‘fabric resource’ room! I have a dedicated room. When I planned the house, I made the bedrooms a little smaller (we only sleep there and how much room do you need to sleep! ), so that I could add some space to the sewing room. It is the largest room in the house and I love it! What beautiful ideas. I am so fortunate to have a room called "My Studio" with 2 large windows upstairs. My husband has a room dedicated to his office upstairs as well. When we moved in some 20 years ago we set a rule that neither of us would bring the work into the living space. It has been great. When we look for something we need for the project it can be only in one room. Everything is there. One thing we both have in our work rooms is an extra chair. I have a beautiful wicker chair that is always ready for who ever visits. I have a room dedicated to sewing,although from time to time a piece or a project gets loose and lands next to my TV chair where I can watch and sew. We have big drop leaf table in our formal dining room which accepts multiple leaves. My husband made a leaf for it with a cutout for my sewing machine. When the leaf is in place, I have a huge flat work surface for sewing and quilting. I have a 2 bedroom apt. The master bedroom is my sewing room. There are shelves on the longest wall with plastic bins filled with stash, a sewing cabinet for my machine with drawers, a cutting table on risers, ironing board and design wall. It works well for me. My husband and I are both quilters. I have the entire master bedroom and part of the sun room for my quilting. We used to share, but that didn’t work very well so we finished the room over the garage and he has his own space to clutter up and make a mess. I just need more time to quilt! Almost half of our home is dedicated to quilting. I got my hubs started quilting with me! Take over the kitchen table? Oh, my, no! My husband says I’ve taken over the house! Actually, there are no quilting supplies in the bathrooms! I have a room dedicated to my sewing although you might find things in other rooms, closets, and even the garage. I have a tiny room that I share with the computer desk. Barely enough room to squeeze through. Thus I have also taken over any nook and empty dresser that has not already been claimed. I’ve always had my own sewing room, just like my mother and grandmother. Only they had to wait until their children moved out, I only have 1 son. It’s not a large or grand sewing room, just perfect for me. Pretty much the whole house is busy with projects, but as it’s not a big place; I need to organize better! I have a dedicated sewing room….but I have storage in every room of the house and outside!!! I have a small room dedicated for my sewing. I have most of a large room for my sewing. I share a corner with our office space. Other wise, there is a large cutting table in the center, two long tables each with a sewing machine, storage and a quilt wall on the end. A great place to work. Just look around, I have a project here, there and everywhere…… all in various stages of completion!!! Look in every nook and cranny I have sewing stuff every where. On my wish list for years is my own sewing studio so it`s all together and doesn`t need to be put away when visitors are coming. The day after my son moved out into his condo, I took over his room and made it my sewing room. Heaven! And lucky for me, he only lives a half hour away. Best of all possible worlds! I have a walk thru closet that connects 2 bedrooms that I recently painted and my husband hung up wire shelving across the entire length for me. It so organized and completely tucked away just for me🙂. I absolutely love it ! Like many others, I have seconded a kids’ bedroom. Chaos reigns there at the moment, and I need some serious assistance to bring back order … and find me! I sew on my diningroom table, which is also known as part of my kitchen workspace. My drop leaf extension is multipurposed. I have fabric, patterns, batting,& everything else I use stashed under beds, in totes, on shelves hidden behind doors. Always fun to find what I’m looking for! I had a room just for sewing, then shared it with the computer, now I am in another bedroom and can barely move there. I could use the basement but it is too cold to sew. I need help? I’ve taken over the kitchen table. Storage is in the garage so I use a torch to search for fabrics in the dark interiors of the cupboard. I am so grateful that we just moved into a new house, and I have a beautiful sewing room with lots of space and big windows! I spent many years with things tucked into every nook and cranny I could find! I’m close to retiring as a nurse, so hopefully I can spend more time in my new space. I have a sewing room/workshop mainly fabric and quilting supplies, but also crafts for my Grand kids like acrylic paint. I have part of a bedroom for sewing and a cutting table and storage in the basement along side the wood working equipment. After years of sewing at my dining room table I now have a room dedicated to my sewing/quilting. I’m the envy of my friends! We moved and I’m delighted to say that I now have a huge room dedicated to sewing. It also has a a storage room off of it filled with shelves for all my material and projects. It’s heaven for me. I lost my dedicated sewing room last November when my son moved in (it’s great to have him here), so I had a 12′ x 20′ "shed" made and installed in my backyard last December (it has a 4′ porch, so the inside is 12′ x 16′). I’m almost done with the finishing work (window/door jambs/trim, painting, and installing the flooring) and expect it to be completed before the end of May. Then I can move ALL my sewing stuff out of my bedroom, including a new-to-me Bernina 830LE which I haven’t used since last August, into its new home. WOO HOO!! I have my own small room for sewing. We have a house that is over a 100 years old and it had a small porch as is common in design for farmhouses in our area. My husband enclosed it and fixed it up as is sewing rom for me. Switched my master bedroom to the small guest room. Separated my office and sewing room by moving the sewing to the master bedroom. It baffles me how my small office/sewing room now fills the master sewing room AND walk in closet! I suspect multiplying is taking place when I’m away! I now have a room dedicated just to sewing. I’m still working on getting it organized and I love it. I rent a New Englander. Just off the dining room is a short hall and space just big enough to make my therapy happy place. Oh I mean my sewing space. Have overflow shelving in the basement. I cannot tell you how happy I was to find a beautiful old house withe a special space to sew!! Look in any corner, you’ll find my sewing stuff. I have a large house I have taken over for sewing. I should be ashamed, but I’m not. Things are beginning to spill out of the room dedicated to my sewing. I definitely need these organizational ideas; thank you! 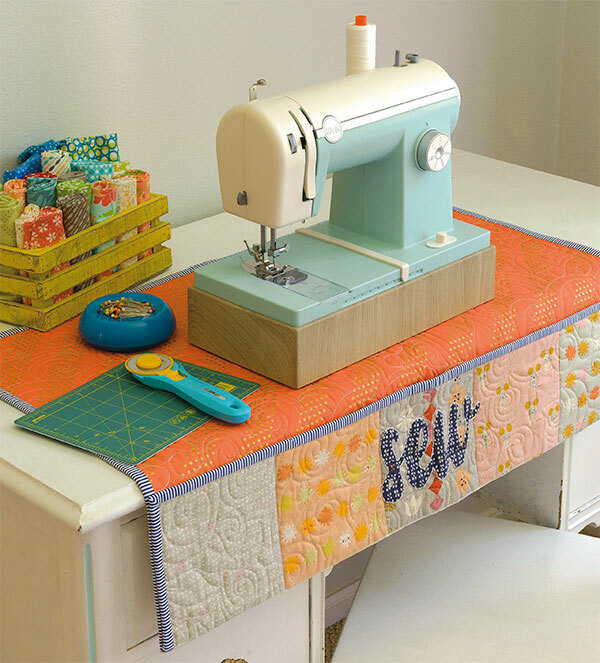 I have had many areas that I have sewn in…from a kitchen table, to a sewing table with my machine in it, to an extra bedroom. Now, my sweet hubs built me a 24×24 studio with lots of room and organization (still working on fine tuning the organization :D). I did have a very nice set up in the basement, but felt isolated as well as a tad chilly, so my hubby agreed that the master bedroom on the first floor was the only other logical place for me. That was four years ago, now the very large room has become a bit overcrowded. It is fairly organized, but still jam packed. Don’t know what the next step should be. I have taken over the guest room and I’m proud! I just reorganized it and it’s my current ideal situation. But when we have guests, they can still feel comfortable and welcome because there’s a place for everything quilty to hide away. I have one room dedicated to sewing, but somehow the fabric and notions are popping up everywhere else in the house and, yes, even in totes in the garage!! I have a small bedroom that I use a s a small studio crammed with tools and fabric , I am constantly looking for beter ways to organize my items. I have a room dedicated to my sewing. You’ll find my hand sewing projects in the living room, though, as that’s where I do that. I have a room dedicated to sewing as well as two sewing annexes, otherwise known as the bedroom and dining room! I sew at the dining room table. Have some of my UFO’s surrounding the table, some in front of the china cabinet, and some in the garage! Most of the garage has my Quilts of Valor Fabric. I have an entire bedroom full of fabric, as well as five 8′ tall bookcases all the way down the hall full of fabric, but right now there is fabric on the floor in front of the bookcases so you can’t walk down the hall! That doesn’t mention what is in storage!! I have a dedicated, very unorganized sewing room. I always need ideas on how to better organize the lot.